This product requires the base game MAFIA III. In Sinclair Parish, a rural town west of the Bayou, Sheriff “Slim” Beaumont rules on a platform of fear and violence. When a Civil Rights leader is murdered, and other activists are targeted, Lincoln joins forces with sister-in-arms Roxy Laveau on an explosive mission to expose the town’s corrupt underbelly. Engage in high-octane car chases, epic new military-grade combat tactics and seedy operations to bring Slim and his corrupt Sheriff’s Department to justice. IMPORTANT NOTICE: Faster, Baby! is part of the Season Pass. 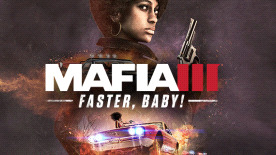 If you own the Season Pass, you should not purchase Faster, Baby!, as you already are entitled to it. Unlock unique Faster, Baby! rewards to further personalize your path to revenge. Equip Roxy’s MK 1020, a silenced SMG that spits hellfire. Put the pedal down in Roxy’s sporty Lassiter Nightcrawler, made for the chase. Plus, get access to the Blue Genius and The Experience outfits, and more!